Next 20 Oct. 2018, the world will celebrate the International Observe the Moon Night 2018. After the huge, international success of the 2017 edition, the Virtual Telescope Project will make possible again for you to join it online, live, from the comfort of your home. All this with the Moon shining above the stunning skyline of Rome. Do you want to live a unique experience, no less than a journey of discovery, from the Earth to the Moon? The International Observe the Moon Night 2018 (InOMN 2018) is just perfect for you! 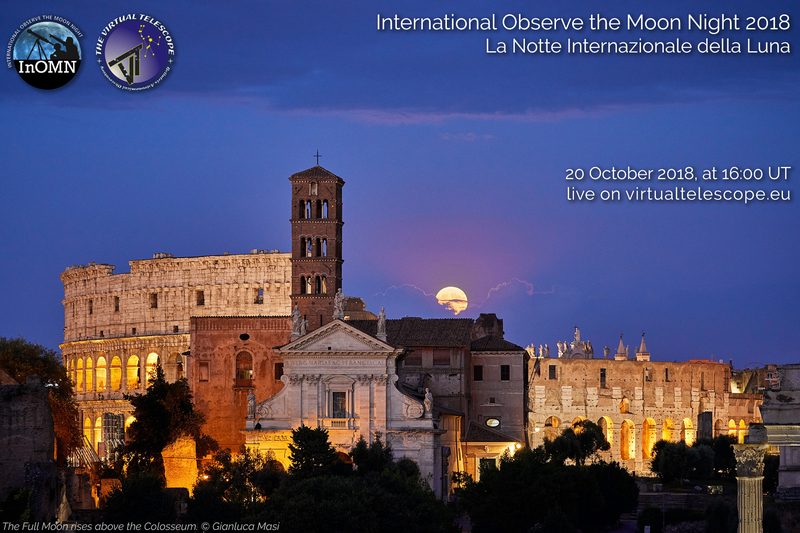 To celebrate this important event, the Virtual Telescope Project will offer a live, online observing session to show you our wonderful satellite, with the addition of the legendary skyline of Rome. Last year, our live feed was extremely successful, so we re happy to offer again this opportunity to the world. We will enjoy the Moon hanging above the celebrated monuments of the Eternal City, with the live commentary of astrophysicist Gianluca Masi, founder of the Virtual Telescope Project. The online, free session is scheduled for 20 Oct. 2018, starting at 16:00 UT. To join the International Observe the Moon Night, you just need to enter, at the date and time above, our webTV page here!